Similar to how tracking body-weight is useful for assessing fat-loss, tracking your training is valuable for assessing muscle-growth and strength-gains. 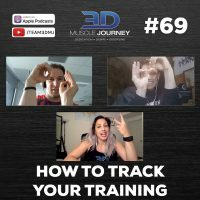 In today’s episode, Eric, Andrea, and Brad sit down to discuss how to track your training. The group go over in great detail the systems they use personally and with their athletes to track training progress over time. Everything from the methods they use to the variables they track are covered. As with anything else, you should know why you are tracking, and what you want to achieve from doing so. Today’s episode is beneficial for athletes and coaches alike, who are searching for new methods to manage their training. Regardless if you’ve never tracked before or are a seasoned veteran, this episode is sure to provide you with new insights and tips. For just hypertrophy, do you need to continue to get stronger or can you do just pump style training to gain muscle? Pump style training is great, but sometimes if the load is too light, your reps are essentially ineffective at contributing towards your goals of size. Hi, great podcast, learning a lot from it and considering a coaching traject while I’m thinking out what my actual goals are. -> you can open the settings of your training file and enable ofline mode. This way the file is available ofline and syncs the data when you are online again. Not sure what the goals was with this one, but you can share the sheet from your own folder and give the client permission to edit it. This way you also see what the client is changing. p.s. I like how open you guys are about how you work, the process, the issues, the difference in how you work. Awesome! Thank you thank you thanks you… especially for the fitness versus rested remark… changed my live. That google doc feedback is great. Thanks for letting us know about the syncing and permission settings. I am glad that you like our openness with our work structure. I know that when people are very forthcoming with the details it helps me a lot, so we figure it might help some of you listeners as well. Great to hear it's working! Thank you for reading our books. We have improved a lot of our site logistics in the past year or two, but definitely have a lot more we could work on. Luckily our social media channels drive most of the traffic to our site which has helped a ton.